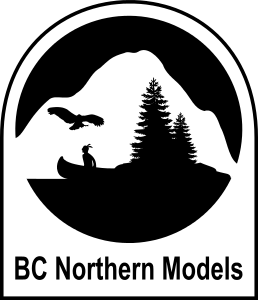 BC Northern Models is a small scale project to support our North American themed model railroad projects. Especially our freelanced HO-Scale BC Northern Railway. This project uses Canadian motive power and rolling stock similar to the units used by BC Rail or CN. Our primary goal is to produce 3D-printed add-on parts for locos like the GP9rm, SD40u, SD/GP40-2W or the GE C40-8M and C44-9WL as well as other hard to find items (at least for us here in Central Europe). On top of that our freelanced Model Railroad offers the opportunity to design our own “rebuilts” Like a wide cab first generation SD40W or a chop-nosed SD7u. To test the limits somewhat we occasionally experiment with very small and detailed N-Scale parts first, so the generally more expensive H0-Scale models can profit from this experience. BC Northern Models currently produces N-Scale coupler packs for it’s own show case layout. Not public sale is currently planned, as we are still prototyping and testing our coupler designs. We plan to enter small scale production of these conversion couplers in 2015. However there are a number of factors that will govern if these couplers will ever be mass produced or not. The same applies for public availability. The future might hold more pruducts in store ), though we would only offer product that we think we be of at least some benefit for the buyer. Next to our Railway related models, we plan to produce a few 1:160 and 1:87 scale models for maritime layout scenery construction, These will be mostly waterline models, which we announced to devellop in this post. As soon as our own FDM 3D Printer becomes available, we plan to make parts for our Model Railroad, the BC Northern Railway. This includes locomotive shells and possibly trucks and frames. In short anything tha could be made in decent detail quality and durability. Other parts for these projects will be achieved by using either readily available super detailing parts or especially produced part that we make and order via https://shapeways.com, if our printer lacks the detail. – Freight Cars (well cars, woodchip gons, bulkhead flatcars, tank cars, etc.). – Railroad structures like a turntable, MiJack crane, harbour acceasoires like cranes or docks or car float bridge, track bumpers, signal masts and targets, as well as trestles and bridges. – turnout and rail crossing tie arrangement for handlaid track, etc.